This week, Christian metalcore outfit We Came As Romans announced tour dates with Asking Alexandria, From First to Last, Our Last Night and A Bullet for Pretty Boy. The first tour date is May 8 in Springfield, Va., and the trek runs through June 9 in Pittsburgh, Penn, with We Came as Romans making stops in Las Vegas, Seattle, Atlanta, San Diego, and Detroit along the way. Of course, the one thing you hear most about We Came as Romans is how invigorating the band's live shows can be. They've become known for their on-stage acrobatics, which include synchronized amplifier dives and spins off of risers. The band also headbangs like the dickens when those breakdowns hit. 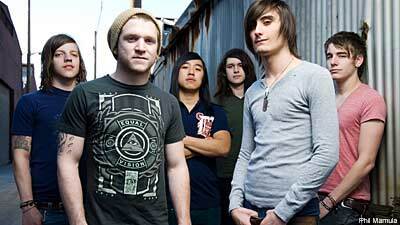 In fact, the band's video for 'Broken Statues' shows We Came as Romans doing just that. "We wanted to do a live video, because a lot of the thing about our band is, the show we put on live, and we do a lot of coordinated choreography, and we wanted people to kind of see that and say, 'Man, these guys look cool. We should check 'em out,'" frontman Dave Stephens told Noisecreep recently. "The song leaked before the rest of the album," 2009's 'To Plant a Seed,' "and it wasn't really planned for that to happen or for the song to become as big as it did. So because it came out early and people have had it for so long, it's become a fan favorite. So, we decided to do a live shoot for that song."